For July Pat has a great plan, it's time to get your setting for 'Let's Go Camping started! The Layout Download is just below Pat's commentary for the month, down below. Also be sure to check out our featured shops! My favorite part of this project has been collecting fabric! Ok, my favorite part of any project is the fabric collection, but when you have a goal of a certain fabric it makes the hunt really fun! 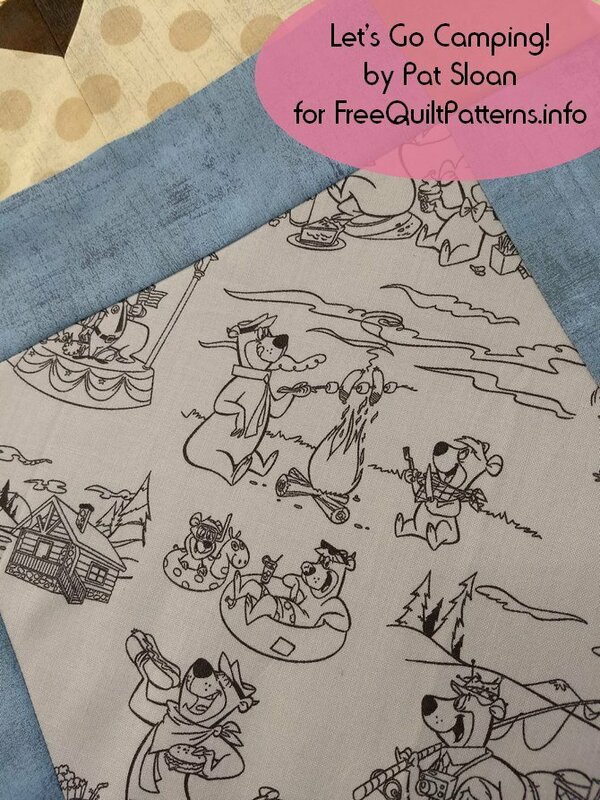 This Yogi Bear fabric is so true of what camping is, eating, fishing, cabins, campfires, and friends. Let me tell you a bit about how I approached the setting blocks. I took a look at the blocks I did so far, and the fabric I was working from and decided that of the colors I used already, the light blue is what I wanted more of. From the camping type fabrics I collected I loved the light with the gray, so I kept all the insides that shade. The pattern has the setting square and full border directions. The pattern has using a smaller square and cutting once for the setting triangles. At my website I give you the formula for cutting twice on the diagonal, which uses a larger starting square. And I have a photo of the sections sewn together. NEXT MONTH, August, we will be back to blocks. Do you have a funny story from your camping memories? We’d love to hear it, tell us in the comments! Let me introduce myself. 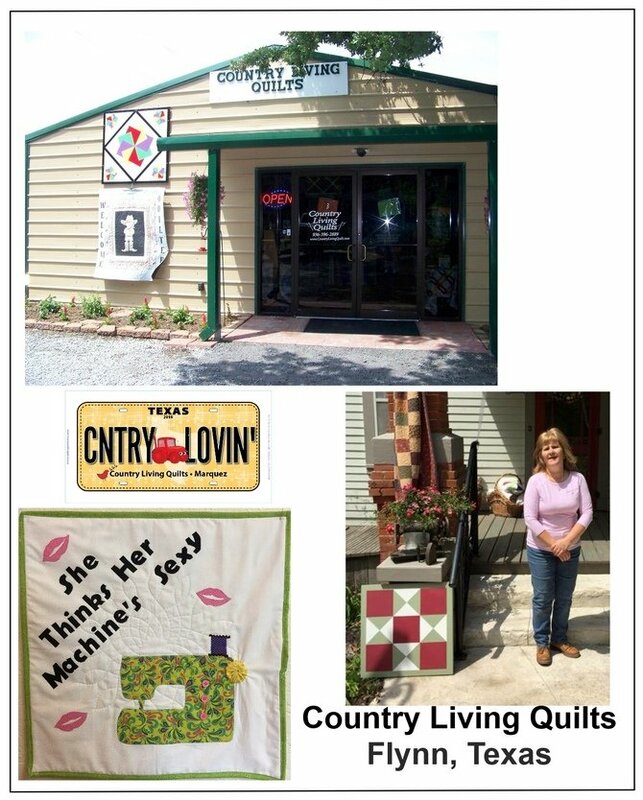 My name is Teri Walker and I am the owner of Country Living Quilts in Flynn, TX. At Country Living Quilts we cater to all your sewing needs. We offer the highest quality "quilt shop only" fabrics, quilting and sewing notions, patterns, books, kits, machine quilting and a wide variety of classes. If there is a product that we do not have in stock, ask and we will do our best to get it for you right away. Country Living Quilts is here to help those people that have never picked up a needle and/or sat behind a sewing machine before, to those that have been sewing and/or quilting for years. If you try to Order fabric online and it will not let you order the amount you actually need, please call as I have put less than I usually have on hand on the website in case someone comes in and purchases a large amount before I can change it on the web. We love having company, so pack up your quilt guild, quilting bee or bus tour and come for a visit. You never know what type of baked goodies you might find waiting for you and we always have the coffee on. We are located in Flynn, TX, halfway between Houston and Dallas off I-45. If you need a place to stop and stretch your legs on a long journey, we have a patio just waiting for you. Don't forget to sign up for our Newsletter and "Like" us on Facebook, so you can stay current on all the upcoming classes and new products as they arrive. We look forward to seeing you soon. If you can't stop by, remember you can always place an order on our website using Pay Pal and it will ship within 24 hours. All packages are shipped signature confirmation so if there is ever a problem, we can track your package. If you do not want your package shipped this way and you take total liability of it reaching you, please let me know so I will not send it this way. This is an extra step I pay for so your package will reach you. 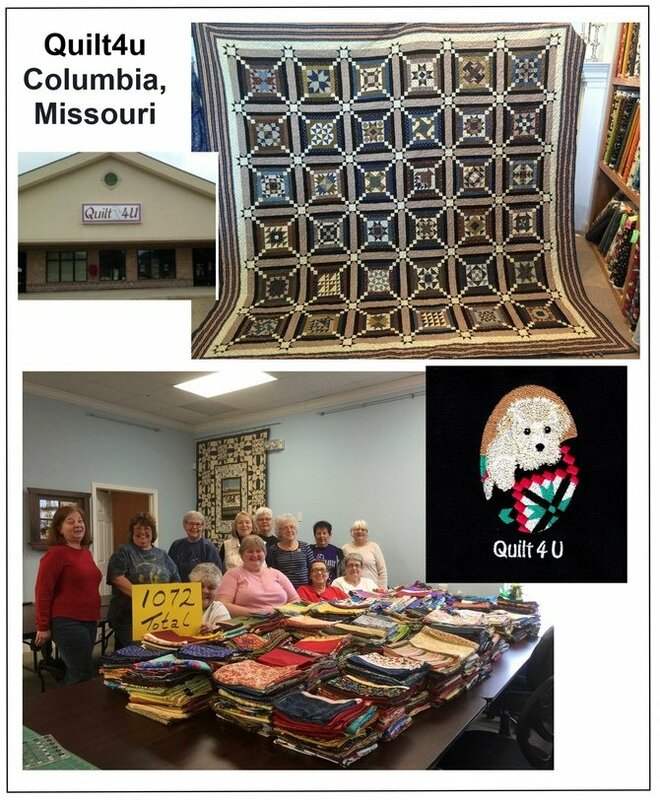 Quilt 4U has been providing the Columbia, MO, community with an extensive selection of high quality fabrics, sewing notions, and quilting supplies, since 2012. The shop also offers professional long-arm services and a wide range of classes to help quilters increase their efficiency and finish their projects. Owner, Marilyn Wine, grew up in a home where quilting was an integral part of life. Her mother (who'd learned to quilt as a child) created many wonderful memories through the hand-sewn clothing and quilts she made for Marilyn and her two siblings. Later on, Marilyn went on to work at her sister's quilting business, where she refined her quilting skills. She is a talented long-arm quilter who loves to share her quilting knowledge with all who wish to learn and truly enjoys helping customers succeed at quilting. Marilyn and the friendly bunch of folks here at Quilt 4U look forward to your visit. No matter your skill level or project size, we're here to guide you through your quilting journey, from start to finish! Are you loving our camping theme this year? Leave me a comment below telling me about your funniest camping memories!